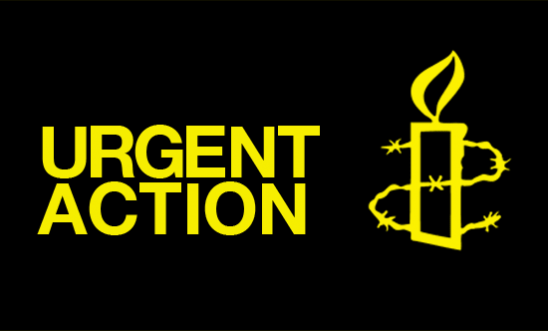 The following is the Urgent Action released by Amnesty International calling on people around the world to write to the Egyptian authorities demanding Ola al-Qaradawi’s release. Ola al-Qaradawi has started a hunger strike. Ola al-Qaradawi has started a hunger strike in custody on 27 June, demanding the end of her arbitrary detention and abusive prison conditions. 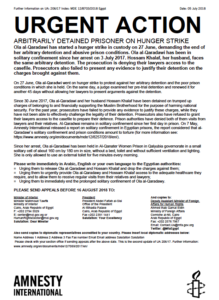 Ola al-Qaradawi has been in solitary confinement since her arrest on 3 July 2017. Hossam Khalaf, her husband, faces the same arbitrary detention. The prosecution is denying their lawyers access to the casefile. Prosecutors also failed to present any evidence to justify their detention on the charges brought against them. On 27 June, Ola al-Qaradwi went on hunger strike to protest against her arbitrary detention and the poor prison conditions in which she is held. On the same day, a judge examined her pre-trial detention and renewed it for another 45 days without allowing her lawyers to present arguments against the detention. Since 30 June 2017, Ola al-Qaradawi and her husband Hossam Khalaf have been detained on trumped up charges of belonging to and financially supporting the Muslim Brotherhood for the purpose of harming national security. For the past year, prosecutors have failed to provide any evidence to justify these charges, while they have not been able to effectively challenge the legality of their detention. Prosecutors also have refused to grant their lawyers access to the casefile to prepare their defence. Prison authorities have denied both of them visits from lawyers and their relatives. Al-Qaradwai remains in solitary confinement since her first day in prison. On 7 May, Amnesty International released a report on solitary confinement in Egyptian prisons, the report considered that alQaradawi`s solitary confinement and prison conditions amount to torture (for more information see: https://www.amnesty.org/en/documents/mde12/8257/2018/en/). Since her arrest, Ola al-Qaradawi has been held in Al-Qanater Women Prison in Qalyubia governorate in a small solitary cell of about 160 cm by 180 cm in size, without a bed, toilet and without sufficient ventilation and lighting. She is only allowed to use an external toilet for five minutes every morning.  Urging them to immediately end the prolonged solitary confinement of Ola al-Qaradawy.